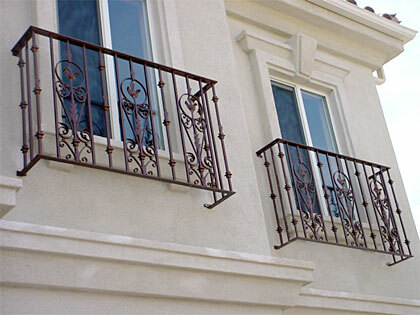 JRC has been providing wrought iron windows and wrought iron window guards to Los Angeles, Orange County and the Inland Empire for over 30 years. Providing our clients with personalized and professional service, we will work with you to design the perfect wrought iron windows and/or wrought iron window guards for your project. Our wrought iron windows and wrought iron window guards are installed by our team of highly trained professionals and are made with only the finest materials. Perfect for residential homes and larger commercial projects like apartments, restaurants and hotels, JRC can also design decorative window coverings and special window guards to allow for fire exits and other emergency requirements. Powder-coating is a three-step process where the metal is sand-blasted, painted, and then baked in an oven to produce a durable high quality finish. JRC highly recommends powder-coating to ensure enhanced beauty that will last a lifetime. For a free estimate of your project fill out our online Request a Call form or contact us at 626-280-2300 or Toll Free: (877) 280-2994. E-mail inquiries can be sent to info@jrcwroughtiron.com.